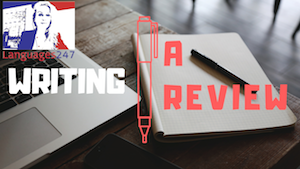 The main difference between writing a report and writing a review is that you give your opinion in a review. A review is to express your point of view on a book/film/etc., being informative yet giving an assessment of value based on your technical knowledge of the matter. You have to take into account your audience and the number of words required. Make sure that you make your experience relatable and that your draw comparisons so as for your readers to be able to judge the product on its own merits. What I disliked most was…. The story is set in…. Introduction: I recently (summarise the film / experience etc. and give your general opinion) ……….……………………………………………………………………………………………………. Conclusion or recommendation(s): To conclude ….…..…..…..…..…..…..…..…..…..…..……… ……………………………………………………….……………………………………………………………………………………. Have any doubts or questions about Writing a Review in English? Please post them below! We look forward to hearing from you.